There’s nothing worse than arriving home to find that your house has been flooded. We all know that flooded carpet is a serious issue. First, remain calm, but at the same time, you need to get straight to work on the wet carpet for a number of reasons. As well as preventing mould, drying out your carpet will help to save it. The longer that your carpet is wet, the less chance there is of saving it. When a carpet gets wet, the glue that has been used to attach the carpet backing starts to disintegrate, and as it does so, the backings that keep the shape of your carpet doesn’t just look like yarn, start to pull apart and separate. If your carpet doesn’t dry quickly enough, you’ll end up with wrinkles or bubbles in the carpet that are evidence that the backing has indeed come apart. In the worse case scenario, the tufts of your carpet can be pulled out easily, since there’s nothing there to hold them in place. With flooded carpets, it’s important to remove surface water as quickly as possible. Pull back the carpet to get the dryers on to it. You may find the underlay has been trashed, but if you can get the carpet dry, it may be possible to save it. A tip here is to remove all the furniture and then starting from a corner of the room, pull back the carpet wearing a pair of gloves and users pliers. We recommend at this point that you call out an emergency flood professional, or start to extract the water yourself with a wet and dry vacuum. Meanwhile, be sure to remove any electronics and personal belongings from the room. The carpet should be pulled off the tack strips so the air can get to it once the excess water has been removed. Do not be tempted to cut the carpet away as it will be difficult to seam it back together, and it won’t look pretty. Once the carpet is dry you may have to replace the pad beneath it, but most times the carpet will be able to be stretched back into position on the tack strips. If you have more extensive damage to your floors or walls, then you’ll need to call in the insurance company to get some estimates for repairing the damage. Once the carpet has been properly dried and is re-installed, then we’d recommend that you get a professional carpet cleaner to give it the once-over with a truck-mounted hot water extraction unit. This will help prolong your carpet and leave it smelling and looking fresh and clean. 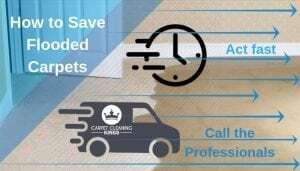 Carpet Cleaning Kings has years of experience and has dealt successfully with numerous flooded carpets. We offer a 24-hour emergency flood water service which includes water extraction, structural and timber drying, mould, and bacteria treatment, carpet drying with state of the art driers. If you need help, don’t struggle alone. Call us any time of the day or night on 1300 7000 75, and we’ll send a technician straight to you.